When the Rev. David Hollingsworth, a retired ordained deacon who is now a resident at the Coshocton Care and Rehabilitation Center, read his recent Three Rivers District newsletter, The Current, he noticed an article about the upcoming spring meeting of the district United Methodist Women (UMW). As part of the meeting, the ladies were collecting seeds for the Jackson Area Ministries gardening program. “Guess who started that program 40 years ago?” Hollingsworth, knowing the answer, asked me in an e-mail. In 1973 Hollingsworth, a recent graduate of Scarritt College in Nashville, TN, came to Jackson to work as a church and community worker for the Jackson Area Ministries. The United Methodist Church community ministry serves the Appalachian counties of southeast Ohio. Hollingsworth began the ministry of helping people plant their own home gardens by supplying area residents with seeds and gardening plants. 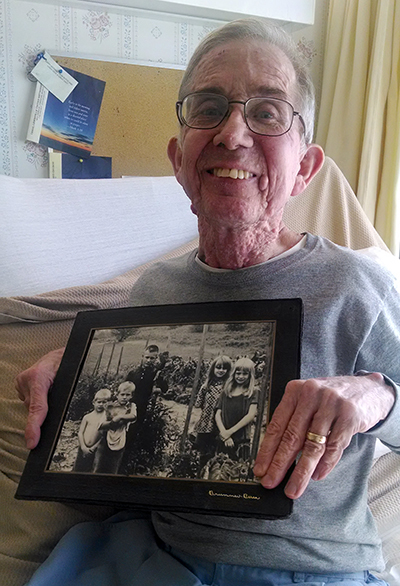 Hanging on his nursing home wall is a picture of five kids showing off some of the vegetables they had grown from seeds given to their family from area church folk. He began this ministry – one that continues to assist low-income families in becoming self-sustaining – more than 40 years ago. It is a blessing to read about where these seeds have been planted and where they continue to bloom. We do not know where the children in the photo are today but we rejoice that their lives were touched by the ministry of The United Methodist Church. In this spring season, as we await buds to come blossoming forth, may we think of ways we can plant and sow seeds of ministry that will continue to bloom and bear fruit. *Rev. Jim Humphrey is superintendent of the Three Rivers District.